Iowa Hawkeye makes his debut at Ballarat at Sunday when he is one of our two runners at the meeting. Iowa Hawkeye runs in race two, the 3YO Maiden Plate over 1200m, jumping from barrier seven with James Winks to ride. Mike Moroney feels tthe son of Lope de Vega has struck a strong race for his first time at the races. 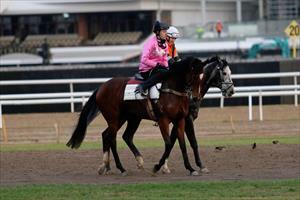 “It’s a particularly strong looking race but we’re happy with him,’ Moroney said. “He has shown us gate speed at home but I think with the depth of the race we’ll likely ride him off the speed from the draw. Brutal Power (pictured) is our other runner and he is in race one, the Maiden Plate over 1400m with Patrick Moloney to ride from barrier three. It is the third start for Brutal Power which finished sixth over 1200m at Sandown at his last start. “There are some well-bred first starters that we don’t know about but we are happy with our horse and his form looks good enough for a race like this,” Moroney said. “He’s had two runs now so he’s fit enough and if things can go his way then I’m expecting him to be in the finish.